Why Real Wood Flooring? 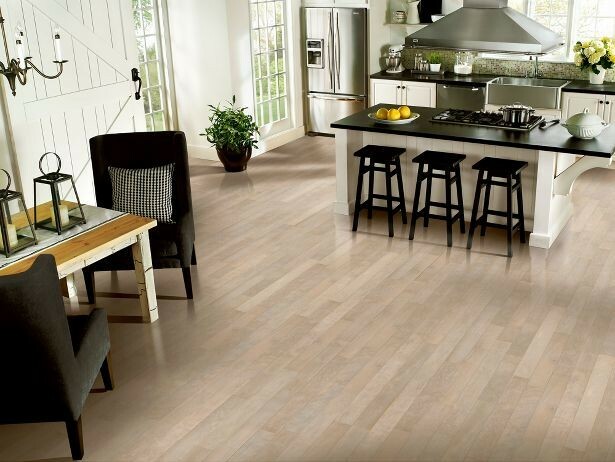 There are many benefits when it comes to using a real wood option for your floors. Besides the classic beauty that this gorgeous floor gives to a space, it can also last the test of time. Real wood surfaces are part of the front runners of longevity pertaining to home decor. Not only will it increase the value of your home financially, you will also enjoy your wood floors much longer than most other flooring options. This is mostly due to the fact that these floors can be refinished after about 5 to 7 years of wear and tear. There are basically two different choices of real wood flooring, Solid or Engineered. Solid wood flooring is the traditional strip or plank cut directly from a solid piece of tree. This long lasting wood can be refinished as much as you want, the only drawback is that moisture and humidity can be issues after the wood is installed due to expanding and shrinking. However, if installed properly with the right spacing you should have no problems. Solid wood flooring must be nailed during installation. Engineered wood flooring is a more modern approach to wood. It is actually 100% real wood, just composed of several layers that are plied together. This style of wood allows for more moisture resistance and does not expand or shrink after installation. Also, it can be refinished, just not as often as solid wood due to the different layers. This wood can be installed floating, through joint mechanisms, or glued. Wood for flooring is typically rated by its hardness. This rating is conducted through the Janka Hardness Test, the higher the score the stronger and more durable the wood will be. However, this should be taken into consideration, because the higher the score the harder it is to install as well, due to its durability. Therefore it is highly recommended that you have a professional install. The Janka Hardness Test is an excellent tool that you can use to determine what wood choice to go with for you floor. No matter what specie you choose, you will be satisfied with how you Real Wood Flooring looks in your home.